Attendees will begin learning didgeridoo: how to make the didge sound and the mechanics of circular breathing. Everyone will have an instrument to play (up to 15 people). Didgeridoo is one of the easiest instruments on which to learn circular breathing and strengthen the diaphragm. Anyone who snores, has sleep apnea, asthma or other breathing difficulties will learn techniques for beginning to alleviate the symptoms through exercises. This drone is much-sought after for its musical qualities as well as for its ability to relax both the player and the listener. Elise Peeples has loved the didgeridoo since she first heard it about 35 years ago at the old Yoshi’s on Claremont Ave. in Oakland. She began teaching herself to play about 15 years ago when she felt the didgeridoo vibration was needed in a monthly sound healing group she attended. After she played for a couple years, she read a study about how circular breathing can help people with sleep apnea; concurrently an acquaintance of hers died of untreated sleep apnea. 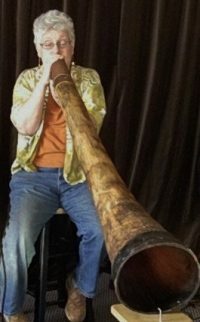 In 2008, she started Sound Rivers to teach didgeridoo mainly for health reasons: sleep apnea, asthma and anxiety as well as over all breathing health. In 2009, she received a certificate in Sound, Voice and Music Healing from the California Institute for Integral Studies.